When talking about high-end laptop bags, Samsonite is my always go-to brand. To talk about the king of luggage, travel bags, and laptop bags world, it surely holds the crown. 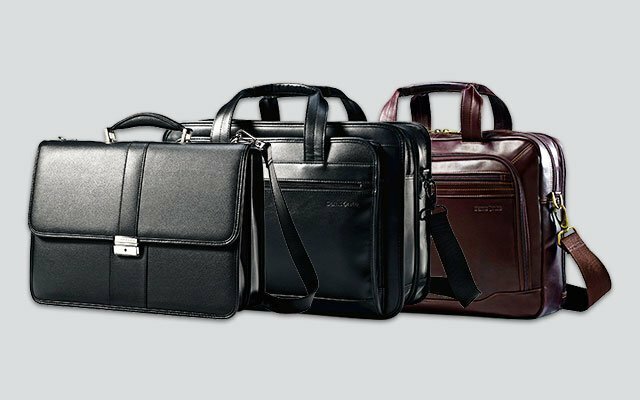 With a long history that’s more than 100 years, Samsonite more and more puts an exclamation mark on their reputation through their rich design heritage that more and more fulfill the modern lifestyle needs, especially in the business professional. 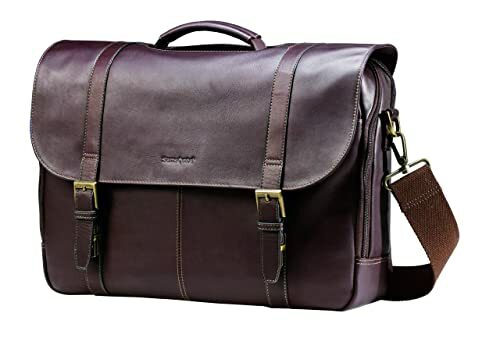 If this is your very first-time hearing of this brand and are in need of the best laptop bags, I’m very please to be your “tourist guide” to introduce the top must-try models of them. On top of this collection is the Colombian Messenger Bag. Its unique beauty is shown clearly on the pure natural cowhide leather with committed minimal treating. For what? It adds soul to the bag as you can see, there are still color variations and imperfections on the surface, which is different one by one. 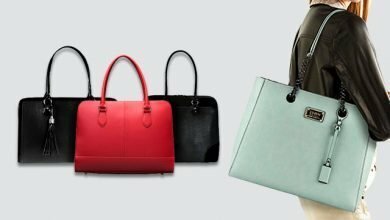 Particularly, take a closer look, you can see that the texture of this bag is matte, not slick or rough or distressed, which brings an elegant, professional, and attractive look. Plus, there are three color options to choose from: black, tan, and brown. All of them are versatile to style many occasions, such as business, interview, travel, business trip, and office. High-quality genuine leather is supple, and this isn’t an exception. From time to time, the bag will be stretchy to accommodate many big textbooks, charge cable, note pad, earphones, smartphone, aside from a 15.6” laptop. Pretty spacious! Buckles are just for show and to open the bag, just click in the snaps under them. Another bonus is some parts of this laptop bag is removable, such as the shoulder padding and the cellphone compartment so that you can “custom” yours due to preference. The highlight of this Samsonite laptop bag is its durability. Aside from the genuine cowhide leather, there’s an additional 1680D Ballistic layer (For those who don’t know, this kind of nylon material is usually used by military with the Federal Government certification). Besides, is a spacious capacity with lots of dividers so that even if your 17.3” laptop is an 8lb thick, heavy HP Elitebook, and 1-liter bottle of water, with other essentials, there won’t damage on its material or stitching. 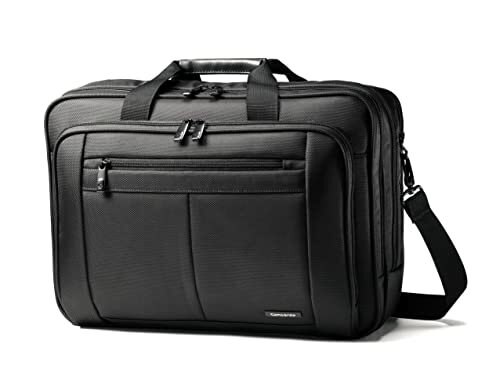 This laptop bag includes many zip-around compartments and you can zip each of them from either side, which is really practical and convenient. I particularly love the second zippered compartment where there are 3 card slots, 2 pen holders, 1 close flap pouch, and 1 smaller zippered pocket that I can keep my daily essentials without need of a wallet to save more space for other stuff. Think it a travel laptop bag is more than perfect because aside from its high protection and streamline construction, you’ve got one band to connect to your telescoping luggage handle. And, within first 3 years of use, if there’s any manufacturing default, just contact Samsonite, they will give you either a full refund or a replacement, followed by their warranty policy. 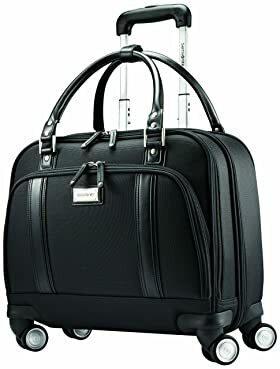 Wow, look at this luggage spinner bag, how stylish and professional it is! 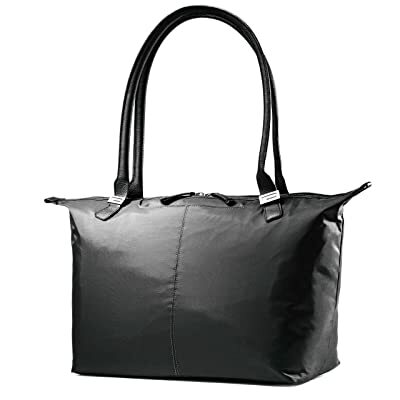 It is measured by 16.5″ x 15.75″ x 8.5″ – stay neatly under almost overhead bins or airline seats. Plus, you will have 4 rolling wheels and luggage handle for easy mobility when in an airport, bus station, train station, or lawyers. These are just additional, but quality is too durable to believe. Even you pull it on rocky or rough terrains, the wheels won’t break down or get stuck. The same with its metal handle. My first impression about this spinner luggage is its sturdiness which is shown clearly through two handles, the hardware, the zipper, and how balance the bag is when you open it (unlike some other luggage bag that tend to fall aside). My guess is, its middle gusset is the key. It features a padded laptop sleeve for any 15.6” laptop as well as padded pockets for accessories. Besides, is the smart weight distribution. In terms of construction, the bag is very neat with lots of small to big compartment for your stuff. 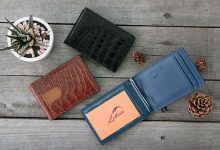 Particularly, the front zip-around one is organized like a travel wallet where you can put in daily essentials like pens, flight tickets, checkbooks, cards, smartphone aside from an iPad, cable charger and other stuff. Plus, is a back compartment with ample room for files. In general, very convenient. 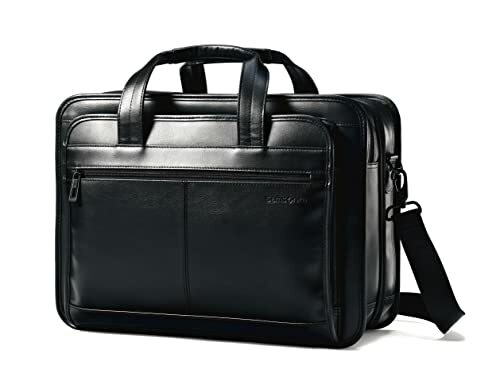 If you want to buy Samsonite laptop bag for business needs, my recommendation is this leather expandable briefcase. The bag is in the depth of 7.25” so I believe you can put in a lot of stuff there, especially the large essentials such as textbook, document, contract, book, and things like that. Flip the bag up, you will see a zippered down at the bottom. Unzip it if you want to expand the bag’s capacity for huge amount of stuff. To save your shoulder from heavy load, they have a soft patch on its removable, adjustable shoulder strap. Or, you can use the double handle traps. And in terms of durability, this is the best. Aside from the tight stitching, its material is 100% genuine cowhide leather that’s been split into layers prior to tanning to keep the best performance, and plus, characteristics. So, just feel free about frayed stitching or torn zippers, they will never happen. 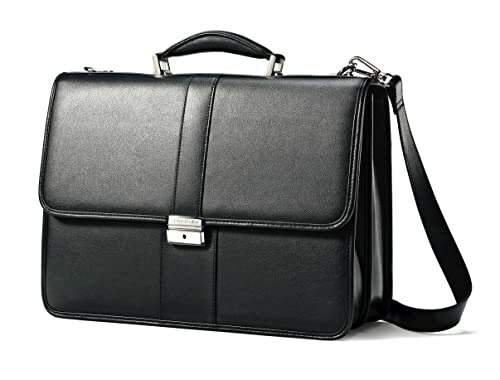 Next up is a typical laptop bag type for office worker with full-black simple outlook mixing with silver-tone hardware. 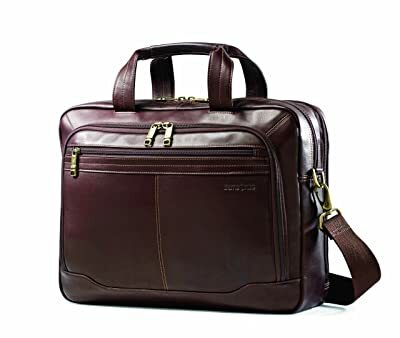 However, compared to other counterparts on the market, the one from Samsonite is much more well-made with sophistication. The whole bag is made of 100% high-quality well-treated genuine cowhide leather. I mean it includes the shoulder straps and handles. But don’t worry, there’s an inner fabric lining for better protection to the leather material as well as your essentials. And the hardware, it’s stainless steel with thick texture to bring a sturdy, durable feeling. The capacity of this laptop is really perfect for a normal office guy. It fits nicely a 15”-15.6” laptop, A4 file document, iPad, notebook, wallet, umbrella, water bottle, adapter, smartphone, and so on. 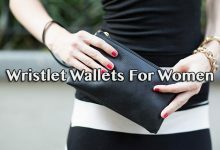 Even, you don’t need a wallet at all because in the middle compartment of this bag, there are many pen slots, card slots, and two huge, roomy open pockets for smartphone and adapter. In general, with this design, you can feel ease in mind that everything will be placed neatly for quick access. This is, on the other hand, a typical work laptop bag for ladies. 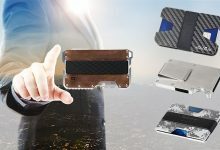 Even, it’s a good option for travel because the material itself is hardly dirt sticking too much but on the other hand, very durable and wear-resistant. Besides, is the high-quality two-way zipper for extra protection and during my 8 months of use, it hasn’t got any snags at all. The laptop sleeve is well-made as well with thick padding that you don’t need the help from its cover as other laptop bags. Take note that it’s perfect for 15.6 laptop. Aside from this divider, other inner compartments are arranged wisely for many things, such as sunglasses, 13” notebook, mouse, chargers, extension cord, shawl, IDs, makeup kit, machine kit, and so on. My most favorite is the zippered pocket where I can put my passport there with ease in mind for highest protection but also quick access when in need. There’s an extra outer zippered pocket for your regular essentials as well. 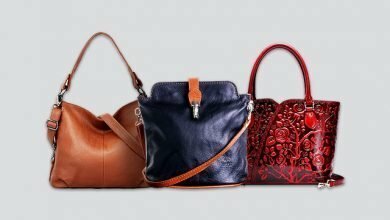 In brief, it’s a roomy bag that you can use on many occasions. Must try! If you’re a backpacker or traveler, I highly recommend this Samsonite backpack. It’s constructed from durable 1680 denier ballistic polyester that has been tested to bear the harshest abusing with minimal wears and tears. The highlight of this bag lies in its capacity. 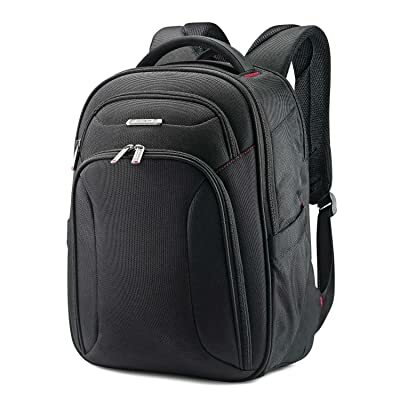 This Xenon 3.0 Slim Backpack sizes only 16.5″ x 12″ x 6.0″, but it includes 4 zippered compartments, 2 extra pockets on both sides, not mentioning that inside them, there are many other smaller slots, and pockets. To cut the long story short, with this wonderful bag, aside from a 15.6” laptop, you can pack for a 2-3-day trip easily and neatly. There is also an air channel system on the backside where you can attach it to your luggage for easy transport. In terms of the hardware, I’ve got nothing to complaint about them. They are very durable, sturdy and thick. The outer performance of Samsonite Colombian Toploaded truly takes my breath and even its roomy interior. I’m a person who don’t like those shiny leather things as I think they are too out of fashion. However, this is truly an exception. Look at it! The whole bag, from its high-quality genuine leather texture, to the unique brown color and yellow-tone hardware – they match together perfectly to bring a classy, professional and modern look. In my opinion, this is a perfect choice for businessmen or officemen. Another surprising feature is contrast to its slim and neat look is a super roomy interior with lots of compartments, slots and pockets. 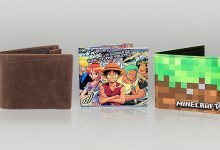 There are even slots for pen, cards, and smartphone that you don’t need a wallet or checkbook anymore. The sleeves for iPad and laptop are well-padded, especially the laptop compartment, it’s in the middle of the bag for even more protection. Take note that it fits nicely any 15.6” laptop. This bag comes up with two handles for those who prefer a professional carrying style. However, on those days with heavier load weight, you will find the removeable adjustable shoulder strap is really useful. It not only keeps your hands free, but its flatness also helps your shoulder painless. This Kombi Small Backpack is, I guess, one of the most favorite of young men, no matter he’s an office worker or a traveler. The reason is firstly, its outer performance is neat and modern, matching nicely nowadays rushing life. Secondly, is its durability. The bag is crafted from rugged ballistic nylon material and its details are from genuine leather. Inside, there’s a thick, sturdy nylon lining that is hardly torn or worn out under sharp-corner stuff. Thirdly, is its roomy capacity. The whole construction of this bag is much simpler than other laptop bags. 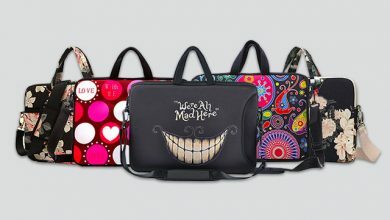 It only includes 3 huge zippered compartments: One extra on the outside, one major and one for laptop. The major compartment is super spacious that you can pack for 1 or 2-day trip with ease, such as clothes, iPad, books, adapter, and so on. The laptop sleeve is, as always, padded with thick layer to ensure the highest protection for your precious laptop. It fits nicely a 14” laptop, take note this to ensure yours will match this bag perfectly. With this style of backpack, its shoulder straps are much more convenient and painless because the load weight will distribute evenly to both sides. The only minor drawback is they can’t be removable. Besides, you also have the top handle and a band on its backside to attach to your luggage handle while traveling. Very convenient, don’t you think? 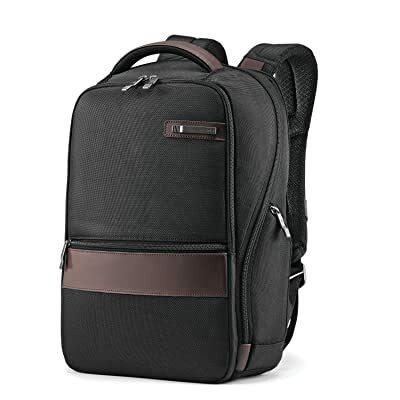 The best-buy Samsonite laptop bag in this collection for its versatility that you can utilize for gym, hang out, work, school, travel, and casual. 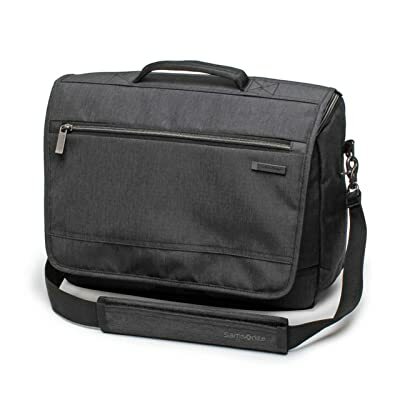 It has a compact and small silhouette, featuring 12” x 16.5” with 26” shoulder strap. The whole bag is crafted from high-grade polyurethane material – a kind of polyester fabric but way more durable and lightly water resistant. Despite that modest shape, its interior will wow you. 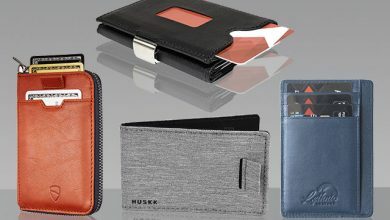 There are 3 slips, 3 card slots, and 1 zippered pocket, aside from a well-padded laptop compartment. Not saying that on the outside, there’s a zippered pocket for your regular essentials to quickly access when in need. One thing that I particularly love in this bag is its padded area on the shoulder strap that keeps my shoulder less painful when carrying a huge load weight during a day. How thoughtful they are! So, that’s the end of this article. 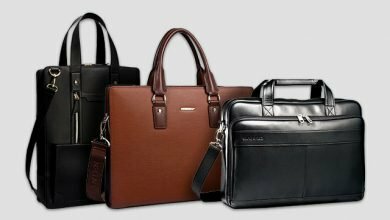 We have just gone through some of the best Samsonite laptop bags and you can see that each of them brings many specific benefits to fit one or a few occasions in your life. that’s why I always advise you to know clearly what you need for a laptop bag. Aside from a protective place for your expensive laptop, what else? I hope that my detail review of each Samsonite laptop bag helps you find out at least one, thanks for reading!